Add my blog button to your blog using the given html code and then leave a link to your blog in the comment section so 1) we all can stalk your blog and 2) I know you want the book. Like my blog on Facebook. You can do this right over there on the left hand side of the page. I will know if you do so you don't have to leave a comment, unless you just want to because you love me that much. Subscribe to my blog and leave a comment letting me know you did. 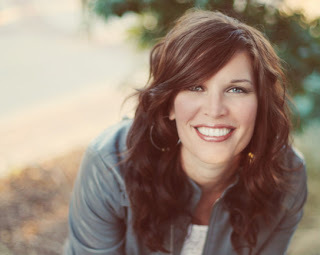 Aside from being the author of Seven and other books, a speaker, and a mom to five, Jen Hatmaker is a church planting wife. She and her husband, Brandon, planted Austin New Church on Easter Sunday 2008. I recently asked her a few questions about church planting life. I think you'll find her answers insightful and grace-filled. From reading your book, you seem to be really good at avoiding the whole "lonely pastor's wife" business that so many ministry wives describe. How do you prioritize friendship in your life? And how do you prioritize friendship while also doing the ministry thing, a.k.a. meeting with people, hospitality, etc.? It feels difficult sometimes for me to do both well. At my wedding shower when I was NINETEEN YEARS OLD (for the love), my pastor's wife who I loved and respected gave a talk, and she looked me in the eyes and said, "When we were in seminary, John's professors told him not to make close friends because it would create jealousy in the church and people would resent us. They said part of our sacrifice was to be each other's best friend to the exclusion of outside couples and families, in order to preserve harmony in our congregation. I want to tell you something: Do the exact opposite of that. Have best friends. Take trips together. Be vulnerable with them. Let love in and give it out with abandon. Have friends closer than brothers and sisters. I've been lonely my entire life, and I want your future life in ministry to be so full of close friends and love, you can barely contain it." I did exactly that. I spend so much time with my friends, it's embarrassing. It's this simple: I don't put any "shoulds" or "should nots" into this equation because my husband is a pastor. I'm a girl. I love my friends just like every girl does. The end. What has been your greatest struggle(s) in church planting and what have you learned through those struggles that might benefit another church planting wife? Early on, I got way too hung up on what people were thinking of me, Brandon, and our little church. Are they happy? Are they inspired? Are they moved? Are they cynical? Are they staying? Are they cheating on us with another church because are not _______ enough? It stole a lot of energy away from that season. And as it turns out, I can't control what other people think, no matter how much I practice mind control. Somewhere in our second year of ANC, God's words finally sunk in: "You glorify me, make me famous, do my work, love my people, teach my Word, and stay faithful to this vision I've given you, and I'll worry about everything else." OK.Check. Off the hook. Someone is always not happy. Someone always wants different music. Someone always prefers their last pastor. Someone always has different ideas. This is OK. We don't have to be everyone's favorite. And that doesn't mean anyone is right or wrong. At the end of the day, are we doing what God asked of us? I mean really doing it? That's all we're responsible for. It's terribly liberating. With five kids and your own writing/speaking ministry, how do you decide what you will or will not do that is church-related? Well, this is easy for me, because our church is very, very not programmed. We don't actually have any. All of our community and discipleship and serving is done through our Restore Communities (small geographical groups). Each group meets twice a month for study and discussion, once a month (at least) for service, and they take the fourth week off to hang out with neighbors and coworkers. We just believe that we can't expect a faith community to live on mission if we're taking up three nights of their weeks. We run a super lean ship and think of ourselves as a sending church way more than a gathering church, or at least as much as. I'm the most un-church-busy pastor's wife on Planet Earth. My husband and I talk all the time about maintaining the "heart and eyes" of the church planter, like we were at the beginning: missional, relational with outsiders, hospitable, outreach-minded. There is such a pull toward the comfortable, established-church mindset as we grow (read: inside focused). How do you and your husband maintain the "heart and eyes" of the church planter as your church grows? So, so, so true. The bigger the machine gets, the more it requires tending. And then more Christians come, and they require the most tending of anyone. This may sound oversimplified, but we make sure we are sticking to the vision for ANC, which requires a lot from our people. A lot. And we preach the hard stuff. We've found this to be a fabulous filter. We seem to keep two groups: mature, discipled believers who want more from this Christian life than clever sermon series and one more Bible study to sign up for, and jaded, angry, cynical non-believers or barely-believers who are giving the church one more chance, and they dig the missional vibe of ANC. But the middle dwellers are a revolving door. They come and leave, not motivated enough to join the mission and wanting to know when we're going to start offering AWANA's. This helps us not get bogged down with trying to please them, which helps us remember what we're doing, which helps us remember who we care about: the other 65% of people in our country who are entirely disconnected from Jesus and his people. There are enough churches positioned to serve the 35% who already believe. We can be this little random, divergent faith community in weird Austin paddling down a different stream. Thank you, Jen! Readers, I plan to do more interviews with church planting and ministry wives in the coming months. Are you a church planting or ministry wife with questions you'd like answered? Or are you a non-ministry wife with life questions you'd like to ask? Leave any questions you have in the comment section and I'll pass them along.